Halloween is one of the best times of the year to add some fun décor to your home. But there’s a fine line between gothic chic and creating a gaudy haunted house. It’s all about choosing the perfect color palette, adding haunting textures and maximizing your décor’s impact to ensure your home is your block’s ultimate posh thriller. 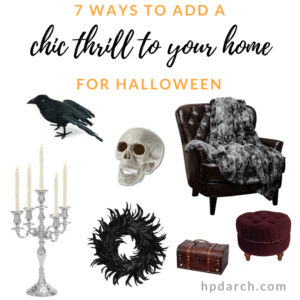 Here are 7 ways to add a little dark glamour to your house this Halloween, minus the ghouls and gore. 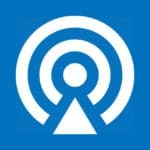 Disclosure: The links provided in this post are affiliate links. They are provided to give you examples of actual items you can use to decorate your home. If you decide to make a purchase, hpd architecture + interiors may receive a small commission at no cost to you. 1. Add a Wreath Treat: Let your door speak a gothic hello with a wreath made of black feathers. Black feather wreaths pop a light-colored door, while shiny silver wreaths — adorned with Halloween extras like metallic pumpkins, crows or skulls — are the perfect match for a dark-colored door. Contrast is key for maximum haunting impact. 2. Light It Up: When the day fades to night, light up your home with candles to set the Halloween mood. Try a pumpkin scent candle to ramp up the sensory appeal. Tall black candles in silver candelabras are a great addition to the table in the foyer or on the fireplace mantle. Another fun lighting trick? Toss a sheer scarf in a dark hue over your favorite lamp for a romantic yet spooky effect. 3. Gothic + Glam: Halloween is all about blending the scary with the chic, so don’t be afraid to bring out the skulls, taxidermy, candlesticks, and vintage gothic artwork to add a hint of dark romance to your tables. Furry pillows and throws and cowhide rugs, combined with leather accents (such as decorative trunks, leather-bound book box set), and a velvet tufted ottoman add a thrilling sophistication. 4. Black is the New Orange: Carving pumpkins with your family? Upgrade from the traditional orange Jack-o-Lantern this season. Instead spray paint your gourds white, silver, gold or black. Add some glitter pumpkins or jeweled lawn pumpkins for extra sparkle. 5. Monochromatic is a Must: While a mix of orange and black was once the ultimate must-have color palette for Halloween, today’s modern frightening décor is all about sticking to one color. Choose either black or white, and accessorize your home with monochromatic décor — from tabletop to rugs, curtains, throws, and pillows. Choose only one room in the home, such as the living room, dining room or foyer, for this décor idea to achieve maximum impact. 6. It’s Tree Time: It’s an ode to Halloween favorite flick Tim Burton’s The Nightmare Before Christmas to add a spooky Halloween tree to your space. Choose a black tree and decorate with silver accents, or make your own by spray painting twigs black and adding a bundle to a black vase. String it up with gothic garland and shiny ornaments for a hint of shine. Jack Skellington would be so proud. 7. Movie Madness: Speaking of Halloween favorites, why not get in the spirit with a movie or TV show accompanied by some fun Halloween movie décor? From the classics like The Witches of Eastwick or Beetlejuice to a family-friendly flick like Hocus Pocus simply emulate the décor of these scare fests for a devilishly chic Halloween. When trick-or-treaters knock, make sure you’re dressed as your favorite character to bring the thriller to life. When Halloween is over, you may want some assistance with interior design for the rest of the year. hpd architecture + design is here to help. Give us a call at 214.751.2304.